Goderich Trees | Goderich Trees is a project initiated by a volunteer group impacted by the F3 tornado that hit Goderich, Ontario, Canada on Aug. 21 2011. It is an endeavor to self advocate, initiate and accomplish as much as we can to heal our landscape. Our goal is to replace the mature trees that were lost to private property owners. 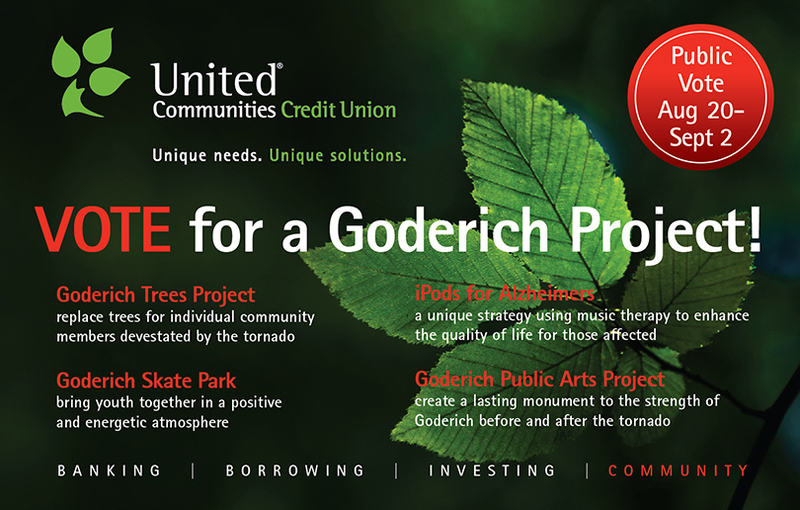 Goderich Trees is a project initiated by a volunteer group impacted by the F3 tornado that hit Goderich, Ontario, Canada on Aug. 21 2011. It is an endeavor to self advocate, initiate and accomplish as much as we can to heal our landscape. Our goal is to replace the mature trees that were lost to private property owners. Goderich Trees: An Unincorporated Association of Volunteers. Plenty of things going on at the Project getting ready for this falls plant date. Mark down Nov 17th on your calendars and stay tuned. A busy weekend is in the works. All homeowners will be contacted by mid October to make sure everyone will have their underground locates done before the 1st of November. This is necessary for insurance purposes and we are sorry but can make NO exceptions, even if you just know there is nothing in the backyard. We still need the paper work and it’s just a few simple phone calls really. 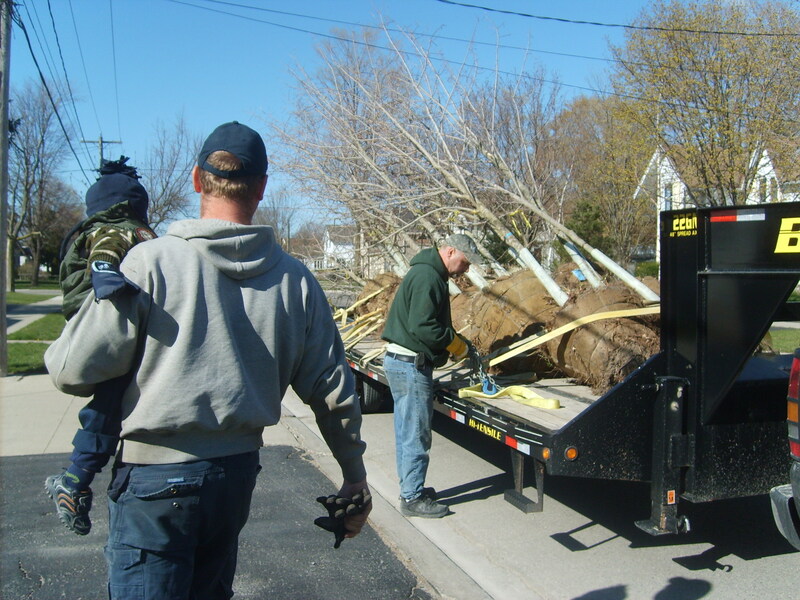 VOTE FOR GODERICH TREES TO WIN $10,000 TO HELP REPLANT OUR TREES!!! Hey everyone! 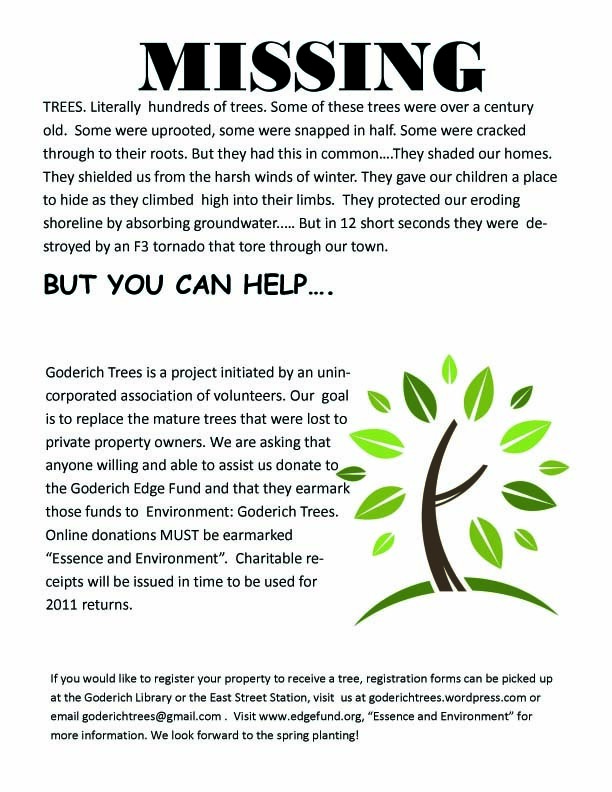 If you want to help the Goderich Trees Project in an easy, simple way, click this link below, like the page and vote for the Goderich Trees Project! It takes less than a minute and you can vote every 24 hours! Help us win $10,000 to replant Goderich’s urban canopy and make a simple gesture to those who lost so much in last years tornado! So, a convoy of four trucks and trailers gathered at Bakers Nursery early Sunday morning. I had all my homework done presuming we could put 8 trees on each trailer and everyone had their list of tree species going to individual address’. Presume nothing should have been my motto for the day. You guessed it! Some trailers could take 8, others 4 and we had to load the two big ones kinda over their weight maximum. Mother God was listening to me sweat it all the way back to town where we arrived safely. 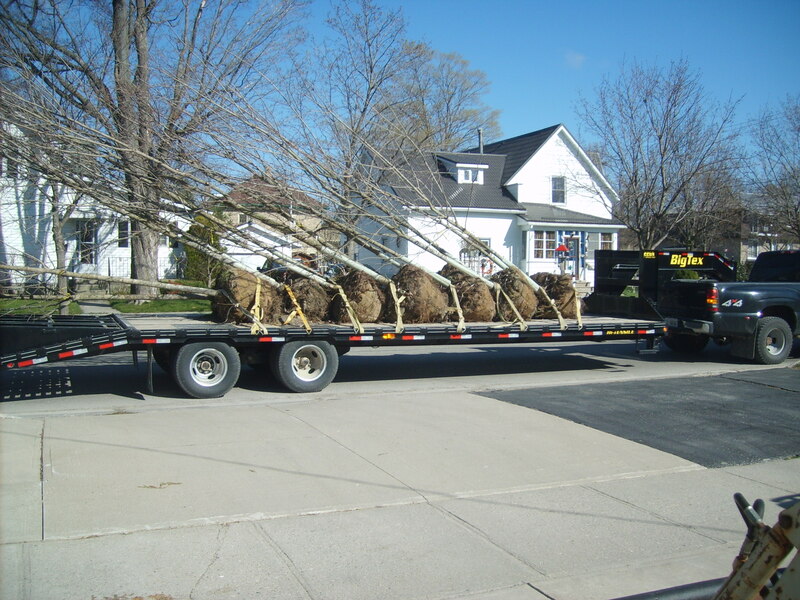 Trees arriving in Goderich from a company near Peterborough named Pro-Lawn Landscaping. Dirk Woudstra, we simply can’t thank you enough! Also Nicolas Knoop of Knoop Industries for having a ten hour day going to get them for us. For the price of gas. Another huge thanks. To Tony Knoop for being long suffering and Jannette Kuiper whom unloaded and is storing these trees for the big plant coming up on Saturday. 14 Sugar Maple going to 14 separate properties. Being planted by a group of volunteers led by Luke Elliott. Why are Trees Important to Goderich? Started today at 5:30, for no particular reason accept that my old body needs to do it’s thing roust about then. Once you’re awake enough to wander to the bathroom. You’re awake. Started thinking about today and all the things that needed doing and decided one of those holiday things…….what ever I forgot, I’ll buy. Met at the YMCA this morning to a group of volunteers about sixty strong. Part of me amazed and the other not. I know what a fantastic community we live in, but there is just something in womans heart that sings when that many people show up to help their neighbours. 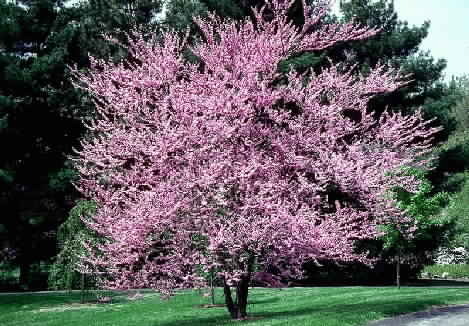 Spring Planting dates and trees available. It’s been awhile since I updated but that doesn’t mean things haven’t been happening. Busy month ahead of us. We’ve got fifteen donated sugar maple coming to Goderich this Tuesday. These 3″ Caliper trees are coming from Pro-Lawn Landscaping in Orono. Our transportation company, Knoop Industries is going to pick them up for the price of his gas. All of these trees have homes and will be being planted on Saturday April 14th by a large group of volunteers. We have purchased “event ” insurance for this and the other planting date of April 28. We have 33 trees on order for that date. All homeowners have to have their locates done to receive these trees. Following due diligence and all that good stuff we are really looking forward to these Events. Trees Ontario along with some local Colleges and our own YMCA will be hosting the larger event on the 28th with informational sessions, brochures and lectures. Media will also be covering this event.